French Fries are a staple at my house. The kids eat them up, they are quick and easy to do and they are a great side dish since they accompany almost any meal. But the thought of deep frying them all the time didn’t appeal to me so I decided to search for a healthier version. I’ve made sweet potato fries in the oven before, however only my husband and I enjoyed them. Unfortunately it did not pass the kids test. I needed to find a recipe for oven fries, but with regular potatoes. 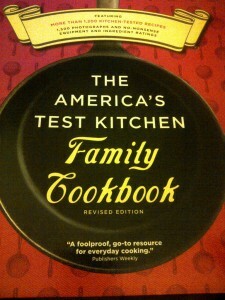 One of my favourite cookbooks is The America’s Test Kitchen Family Cookbook I’ve had great success with the dozen or so recipes I’ve tried from there. In it, I found the recipe for Oven Fries. I made them, and they passed the kid test! They were really good dipped in ketchup! 1. Adjust an oven rack to the lowest position and heat oven to 475 degrees. 2. 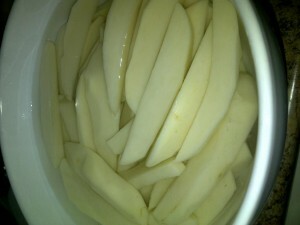 Place the potatoes in a large bowl, cover with hot tap water and allow to soak for 10 minutes. 3. Coat a baking sheet with 4 tablespoons of the oil. Sprinkle the baking sheet evenly with 3/4 teaspoon of salt. 4. Drain the potatoes and spread them out over paper towels. Pat them dry. Toss these with the remaining 1 tablespoon of oil. 5. 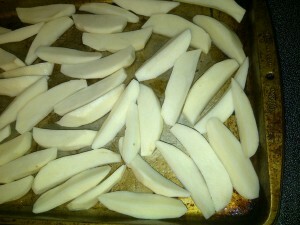 Arrange the potatoes in a single layer over the baking sheet. Cover the sheet tightly with foil and bake 5 minutes. 6. Remove the foild and continue to bake until the sides of the potatoes touching the pan are crusty and golden, about 15 – 20 mins, rotating the baking sheet after 10 minutes. 7. Using a metal spatula, scrape to loosen the potatoes from the pan, then flip each wedge over. 8. Continue to bake until the fries are golden and crips on both sides, 10 to 15 minutes longer, roating the pan as needed. 9. 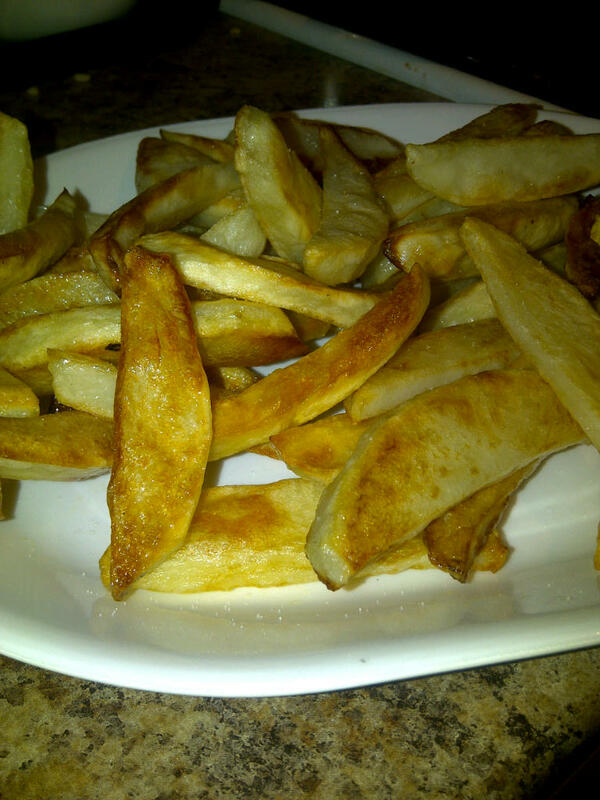 Transfer the fries to a paper-towel-lined plate to drain and season with salt & pepper to taste. There you have it, super easy and they taste great!